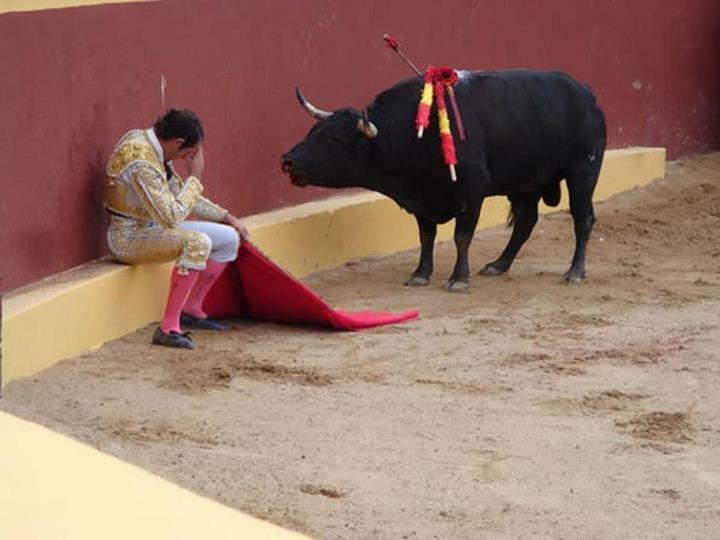 This touching image of a bullfighter who’s apparently had a change of heart isn’t quite what it seems. It’s such a touching image: the bullfighter who sits down, overwhelmed at the barbarism of his craft, and the bull who approaches him, as if in supplication. The noble animal is peaceful, even though it’s bleeding from darts and sword jabbed in its spine. Facebook, can’t you get anything right? Múnera is, indeed, a former matador turned animal rights advocate. But his conversion was far more violent. An aspiring lower-level Colombian bullfighter, he was savagely gored by a bull in 1984. It left him permanently paralyzed. But what about that pose of regret? Turns out that photo is of a much younger bullfighter, Francisco Javier Sánchez Vara, who’s standing in “desplante”—an act of defiance. Because the bull is so near death, Vara is able to rest in its path with impunity. Though users’ reactions are mixed on whether it’s an accurate caption, they seem to agree on one thing. “Poor animal…..intelligent, gentle,innocent soul….as if to say ‘Why? Why are you hurting me ?” wrote Robert Artese. “I am completely against bull fighting, but that is not Alvaro Munera in the picture. This is just an A-hole mocking a dying bull,” wrote Gustavo Carcamo.